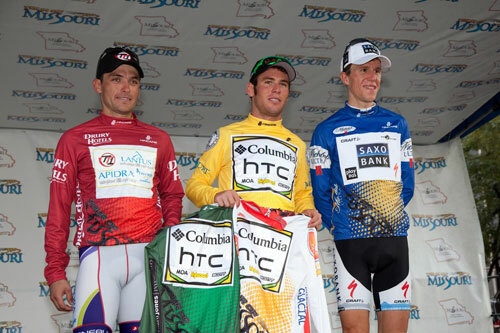 Mark Cavendish (Columbia-HTC) won the opening stage of the Tour of Missouri on Monday, out-sprinting fellow fastmen Juan Jose Haedo (Saxo Bank) and Thor Hushovd (Cervelo) in St Louis. Cavendish came off Tour de France rival Hushovd’s wheel in the dying metres of the 120.7km circuit race to seal the victory in front of large crowds. The Manxman came around him as the big Norwegian faded a little, also allowing Argentinian Haedo through to take second. As well as keeping an eye on each other, the riders also had to contend with an uneven road surface – Hushovd hit a pothole in the final kilometre, causing a slow puncture. Cavendish’s Columbia-HTC lead-out train also disintegrated when George Hincapie hit a hole and lost momentum. “The guys did a great job,” Cavendish said after the stage. “Cervelo tried to give us a hard time at the end but the guys kept control and did a perfect job. Last year’s winner Christian Vande Velde (Garmin-Slipstream) also came down in a crash in the final kilometre fracturing a bone in his hand. The crash took out several other riders including Heinrich Haussler (Cervelo). All were given the same finishing time as Cavendish. Cavendish won an unusual prize for winning the opening stage – a Buell 1125cc 145bhp sports motorcycle. Perhaps he’ll ship it back to the Isle of Man and take part in next year’s TT races. 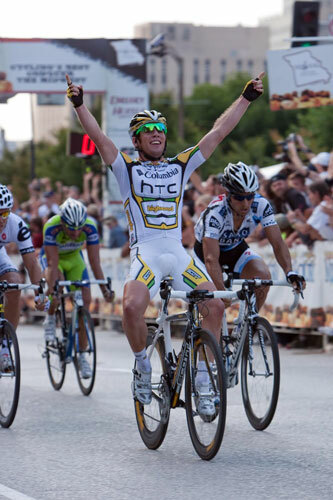 Last year Cavendish won three stages of the race, and took the points jersey overall. He’s now won 22 professional races this year, including six stages of the Tour de France and Milan-San Remo – his career total is now 50. The seven-stage Tour of Missouri runs from Monday, September 7, to Sunday, September 13. Tuesday’s second stage runs from Ste. Genevieve to Cape Girardeau, 180.9km (112.4 miles). 10. Michael Friedman (USA) Garmin-Slipstream all same time. 10. Antonio Cruz (USA) BMC Racing Team at same time.